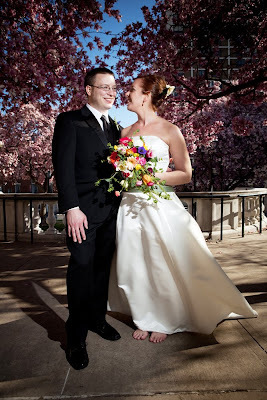 On April 4th, Samantha and Brian wed in Baltimore's Mt. Vernon neighborhood. The cherry trees were blooming on a windy yet beautiful sunny afternoon. 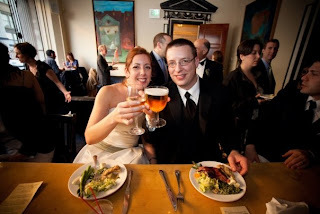 Brian and Sam like to brew their own beer, so it seemed natural that they picked The Brewer's Art on Charles Street for their ceremony and celebration. Frank Hamilton is the photographer who beautifully captured this day. When I talked with Sam, she said she wanted the flowers to be all spring colors and flowers. 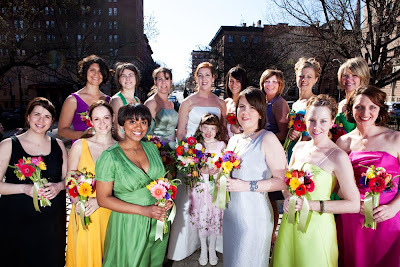 She had 13 bridesmaids, each able to choose their own dress, color and style. When we delivered the flowers to the Peabody Court Hotel, I heard one bridesmaid comment that it was amazing that we had managed to have every dress color represented by a flower color in the bouquets. Sam's cascading bouquet was filled with tulips, gerbera daisies, ranunculus, anenomies, daffodils, bluperum, veronica and amaranth. Brain and Sam's wedding was our first for our 2009 season, which was fitting, as they were referred to us by our first ever Locoflo wedding, Leanna and John. 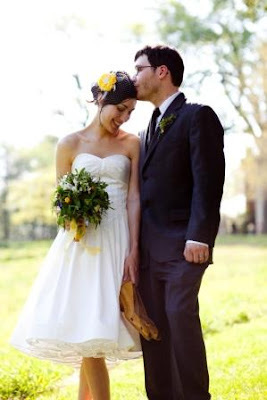 Nathalie and Cory are both artists who were interested in having a Green/DIY wedding. 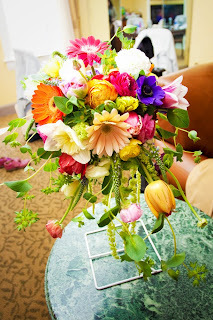 With a great eye for color and texture, Nathalie shared with us her vision for her bouquets. Mostly green with some splashes of yellow, purple and white; succulents; herbs; very textured and natural. 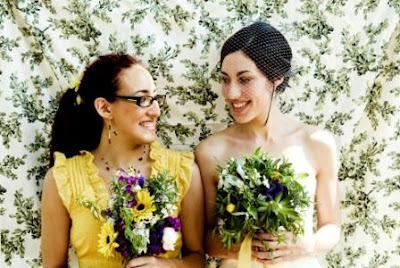 For the bouquets we used yellow gerbera daisies, white and purple stock, iris', hens and chicks, rosemary and lavender. 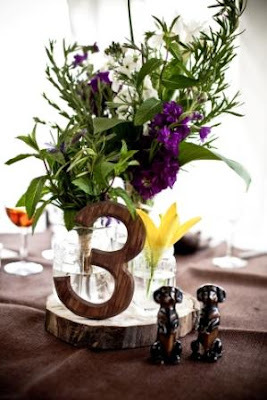 The table arrangements were in vintage mason jars on top of wood slices cut by Cory's dad.We used the same flowers, herbs and succulents in the mason jars as in the bouquet with the addition of yellow lilies and hosta leaves. The wedding took place on a hot, sunny Sunday afternoon in April at the beautiful Woodend Sanctuary. The photographer, Jocelyn Mathewes of Studio Mathewes perfectly captured the love and natural beauty that surrounded this couple on their special day. Check out Jocelyn's blog to see some more pictures and video of the happy couple. I love Mexico. I've only been there once, to Mexico City and Zihuatanejo, but I loved it. I loved the food, the people, the language, the flowers. Today Marina and I worked on a really cool gig with one of our fave green event planners, Lori Hill. The event was called Experience Mexico Meetings. It was a party of sorts to encourage meeting planners to plan meetings in Mexico. We were asked to provide 3 large banquet arrangements. What struck me most about this event was the location. The Mexican Cultural Institute on 16th St in DC is a jewel. I felt a little like I had just walked into the Palacio Nacional with all the beautiful murals, and carved wood and tile. I actually think I was teary for a minute-I loved this building that much. The first arrangement was a bouquet of white viburnum, purple baptisia, sunflowers, calla lilies, gerber daisies, snap dragons and stock. This arrangement stood about 3 feet high. The second arrangement was actually my favorite. All the same flowers were used, but it stood about 4 feet high and was made in a coppery, bird bath. 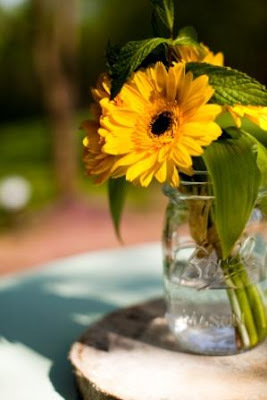 The final and largest arrangement was placed on top of a glass "vase" that was filled with lemons. (not grown locally but grown on the east coast and purchased locally). We left before the party started. Too bad, because I remember in Mexico City, folks sipped tequila with orange slices after lunch. That would have been a great way to spend the afternoon, but we had to get back to Baltimore to start preparing for a wedding on Sunday. 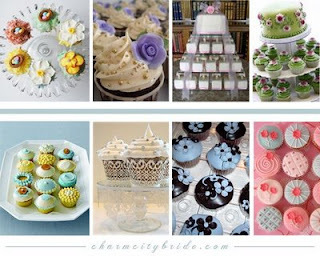 I came across a great new blog recently called Charm City Bride. Lauren Wenchel is creating a one stop shop for all things weddings in the Baltimore area. 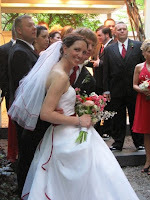 Charm City Bride is a great resource for anyone planning a wedding in Baltimore. It includes vendor referrals, stories of real weddings and loads of wedding planning resources. You can tell that Lauren had a design background. Her inspiration boards are gorgeous! Colorful, creative and inspiring, Lauren has collages for everything including cupcakes, shoes, cocktails, dresses and flowers! (Check out the LoCoFlo collage she made!) I can tell you that Marina and I are envious and can't wait to meet with Lauren to get some ideas on how we can do our own electronic inspiration boards. Be sure to check out Charm City Bride! This morning I woke up early and headed out to Bridge Farm Nurseries in Cockeysville, MD. When I pulled in at 6:05 AM, Mel Heath, the owner of Bridge Farm was out cutting peonies for our order. Since Mel doesn't use greenhouse or high tunnels, peonies are his first big crop of the season. Mel is serious about peonies. He takes such care in growing them. He loves those plants so much, he often ops not to cut them, even though he could sell the blooms, because he knows the plant is too young to thrive after a cutting. From the barn, all I could see were rows and rows of peonies, and Mel's orange cap sticking up between rows. 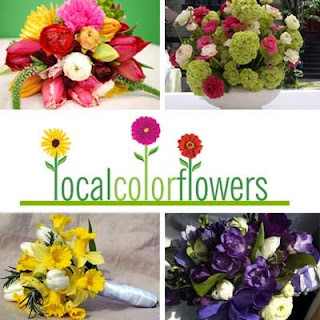 Using locally grown flowers means we use what's available when it's available. From week to week, we never know what it will be. This uncertainty is the key to creating unique, one of a kind arrangements. I picked up 220 pink peonies this morning, along with some beautiful apple green viburnum and bleeding hearts. These are the flowers we'll use for our Mother's Day arrangements. Check back for a look at the finished products.